The slogan of this year’s climate talks is “black to green” - appropriate, given the dirty energy companies that are bankrolling the conference. While the sponsors hide behind green branding, their core business models depend on coal, oil and gas, and are therefore absolutely incompatible with the Paris Agreement, let alone a planet still habitable in the future. Our new infographic and fact files, jointly produced with Corporate Accountability, zoom in on the climate culprits taking centre stage at the negotiations in Katowice, Poland. 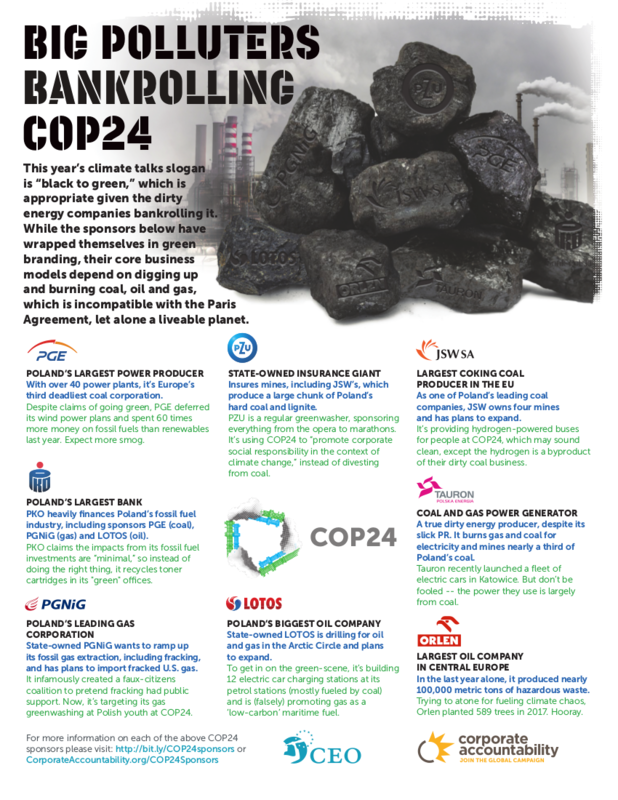 More information on climate culprits TAURON (coal, oil and gas); JSW (coal and gas); PGE (coal); PZU (insures fossil fuels); PKO Bank Polski (finances fossil fuels); PGNiG (gas); LOTOS (oil and gas); Orlen (oil) bankrolling the talks can be found in our: FACT FILES! Read our fact files on the corporate sponsors of COP24.